KOSENRUFU : Let’s spread it worldwide ! The teaching of The Mystic Law, Nam Myoho Renge Kyo, flows freely to all humanity the world over (Kosenrufu). Like a roll of cloth unfolding and like the current of a great river, this Law spreads out and covers all, with no discrimination based on appearance , social status or ethnicity . Kosenrufu actually is the movement “to communicate the ultimate way to happiness” to people all over the world. Above all, it is done through the correct philosophy & teaching of Nichiren Daishonin’s Buddhism, in which we chant Nam Myoho Renge Kyo. The Mentor-Disciple relation, as in the passing of the teachings from Nichiren Daishonin to his followers. Moreover, in the present context of SGI, it refers to passing of the teachings from President Ikeda to the worldwide members and new friends. This refers to the impartial spread of this teaching. As a result, it transcends national borders, social classes and any other distinctions. Hence, like a roll of cloth unfolding and like the current of a great river, this Law spreads out and covers all, with no discrimination based on appearance , social status or ethnicity . Most noteworthy, Nichiren Daishonin made it his lifelong mission to widely propagate his teaching of Nam Myoho Renge Kyo, the essence of The Lotus Sutra. He spread this Law, in conjunction with Shakyamuni Buddha’s call to spread The Lotus Sutra. Eventually, this was to be carried forward into the last five hundred years after Shakyamuni’s passing over. For this reason, the entire Jambudvipa (the world) was to be covered, with the aim of never allowing The Law to be cut off. It is a continuous process, with no static end point. It is infact a continuous flow & effort towards promoting and spreading happiness to people all around the world. As a a result, we must start spreading it right here, wherever we are. Eventually, we aim to bring abundant happiness & good fortune to millions of people worldwide. 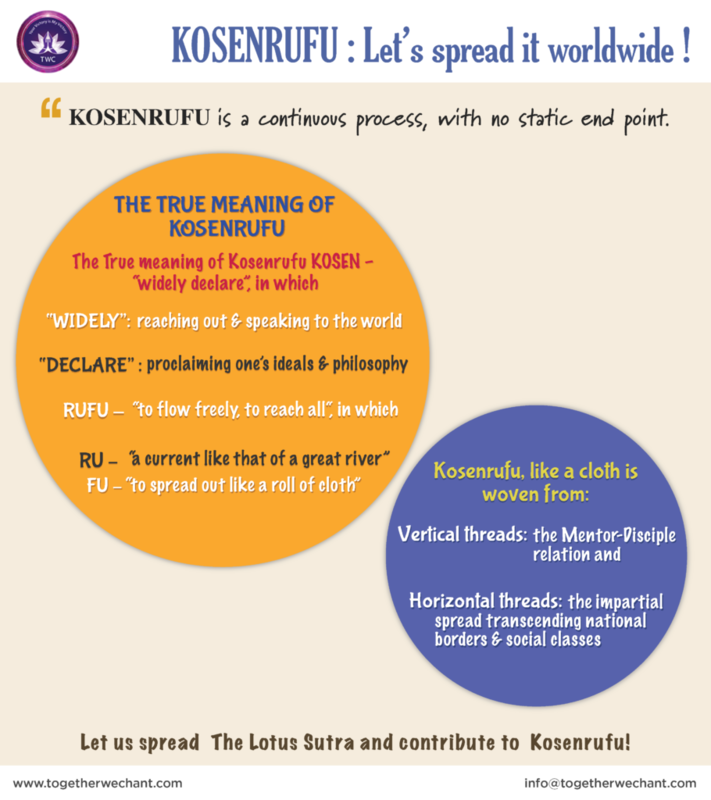 Moreover, achieving world peace through Kosenrufu is a vow that each of us SGI members has taken upon oneself. And due to this, each one of us is constantly making efforts towards worldwide Kosenrufu (spreading The Lotus Sutra). We do this via introducing the practice of chanting Nam Myoho Renge Kyo to others, and participating in Gakkai activities at a District, National and even International level. Here, at TogetherWeChant, we are doing this through the online platform, via this website, your very own Android App, YouTube Channel, FB page, Twitter, and other social media handles. Let us all come together and be a part of this wonderful peace mission through our Kosenrufu efforts. Even more, let us contribute not only to our own personal victory but also to the victory of millions of people around the world. Together We Chant as Your Victory Is My Victory! The reference for this article has been taken from the official website of SGI USA along with my own views based on my understanding & experience with chanting The Mystic Law myself. It is no way a replica of any articles available online. Shiti Gautam is a member of Singapore Soka Association (an affiliate of Soka Gakkai International (SGI), Japan) since Dec 2013. Through this website & an Android app, TogetherWeChant(SGI Buddhism), she & her friend aim to contribute to Worldwide Kosenrufu through the Online platform. These two have a Mission of "1M.1M", which aims to help 1 Million people connect globally & chant 1 Million Daimoku each, not only for their own victory but for the victory of others too ! To know more about chanting of The Mystic Law, read Shiti Gautam's articles on her website, http://www.togetherwechant.com under the blogs & explore sections. Testimonials are the actual proof of victories achieved for others by chanting for them. Contribute yours too!